Every wedding is unique in its own way by establishing the entrance dance or style. Some of these entrance theatrical tactics are made funny and jovial by the flower girls and page boys. Rarely will the theatrical tact determine your choice of flower girl dresses but some like ballerina will need a ballerina flower girl dress or shoes. Therefore, when choosing your entrance ideas know if you need a special type of dress. There are several entertaining ways to keep your guests glued to the aisle as the little girls come forward. 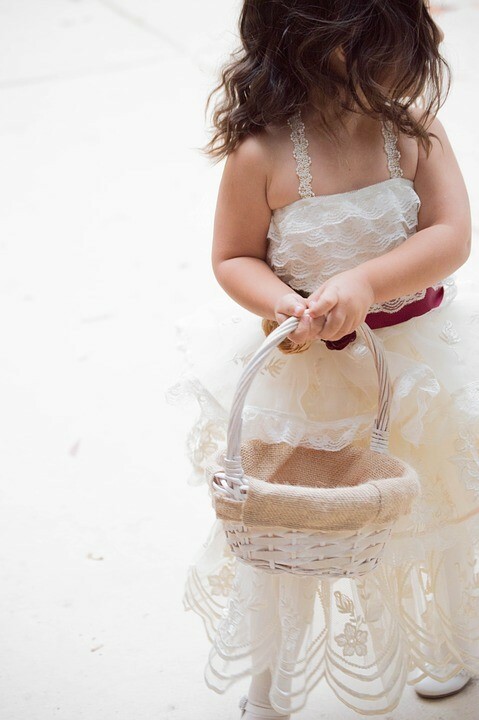 However, ensure the girls well oriented on what to do, carry the basket or flower ball amongst other ideas. Some others require one to carry a message placard that should be well displayed for everyone to read the writings. The Idea is traditional yet the most adorable amongst many other ideas. The petals are scattered over the aisle leaving a well-decorated pathway for the bride to walk over. Different colors of petals from a collection of various species of roses are a heavenly decoration on this day. However, you may choose to wander away from the traditional basket and look for something else with a resemblance to your theme or location. The wands not only compliment the flower girl dresses but also gives a glittering impact on the dresses. The balls or stars of the wands light up the aisle making the occasion look humorous with a mixture of color and decorations. The selection from where to choose your wands to range from ribbons, stars, balls and hearts. Like a little angel, the girl walks down the aisle wings spread across her shoulders. Sometimes the wings matching the flower girl dress or a color that compliments the dress stands out from the other bridesmaids. The idea enlightens the mood of your guests and keeps them waiting to see the bride who sent her guardian angel ahead of her. Choose to start off your day with this tremendous idea of balloons flying over the aisle. The well-controlled balloons are controlled by use of thread when the little one leads the way. The idea is excellent because it gives the girl concentration and walks straight on without minor interruptions. An amazing idea of how one wants to unlock the partner’s heart on this material day. Since they become a couple it an indication of how they share their real-life ideas and ambitions. The girl walks to the aisle and hands over the key to one of them who in return hands over to the partner. Most brides struggle on how to make their entrance appealing and the talk about of town most elegant wedding. The ideas are simple to follow and only make sure they match your wedding. Only when necessary you need a flower girl dress that matches your entrance idea. However, most of the common ideas go well with the dresses in the market.